If you're in the market to Sell Used Cars, there are a number of ways you can go about it. First and most obviously, you could trade in or sell used cars at your local car dealer, but we all know how that goes. The more you get for your trade in, the less you will get off the sticker price of the car. And these days, not a lot of us are in the market for a new car anyway, so this option may not even suit your particular needs. Second, you could always try to sell your used cars yourself. However, that requires a great deal of patience, false leads, people who call and never show up, and of course, you're faced with the cheapskates who want your used cars for next to nothing. When you consider all the time you will spend on selling your used car yourself and then divide it by the hours you've spent, chances are you are making very little per hour off the deal. Third, there is always the scrap option. That's easy but these days with the price of steel so low, you're not likely to make much money scrapping your used cars. The fourth -- and we feel "best" option -- is to contact us. We're a family owned and operated company who understands the hassles of trying to sell your used car, and what we do best is eliminate the hassles for you. We'll ask for basic information to get an idea of your car's condition and value and then figure out the best price we can offer you. Once you accept our offer, we'll pick up the car for free (we don't add additional towing charges -- this can make a big difference in the final price when you try to sell your car) and pay you cash on the spot. It's that simple. You'll spend a few minutes on the phone with us, and we do the rest! Sell Used Cars Today, Any Condition! 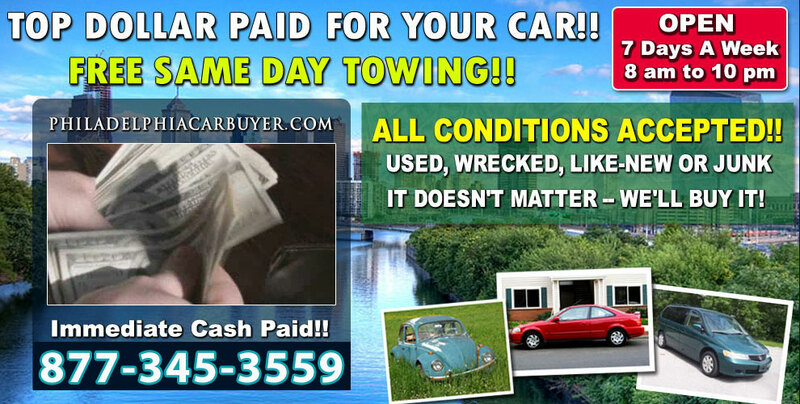 Sell Your Used Cars - Top Dollar Paid!